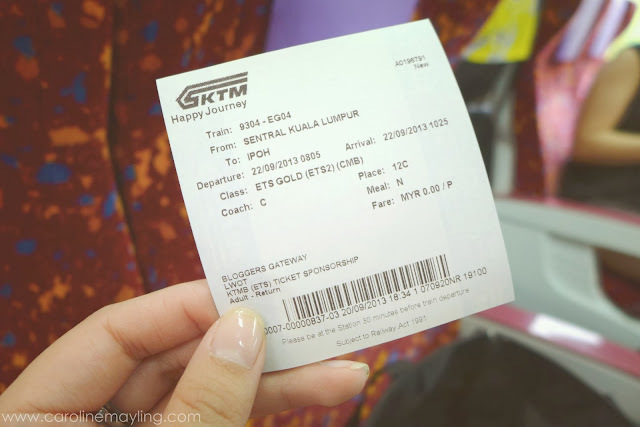 As mentioned in my entry post for Spa Getaway Trip with The Butterfly Project Malaysia, I have never taken ETS train to travel. Hence, it was my very first time and I was actually quite excited for it. I woke up as early as 5am in the morning to get ready to KL Sentral as our train scheduled at 8am and we have to be there by 7.45am. Upon entering the train, I know I'm going to have a comfortable train ride with cushioned seats and sufficient space for leg room. You can also place your luggages on top of the cabin or place it under the seat. Passengers can always refer to the attached ETS Route Map inside the train to check on their destination. There's also an announcement made for each reaching destination and for the next station. Passengers also need not to worry about being hungry throughout the journey especially for the long one as you can always go to the counter and grab your favorite meal. You can choose from sandwiches, nasi lemak, fried noodle, fried rice, etc. The train ride was not as quiet as I expected as it filled with activities! One of the best parts was when we're all given with beauty bag that contained travel essential kit that sponsored by 10 brands. Firdaus and Shawal from Lost World Of Tambun were already there waiting for all of us at the station. We then were brought to the coach to bring us to the Lost World Of Tambun for an awesome adventure! If you're looking for comforts to travel on long hour journey, ETS Train is certainly another great alternative to driving your own. ETS has also announced their new train schedule, do log on ktmintercity.com.my/index.php/en/perkhidmatan/ets for more information.